Characterful cottage with beamed ceiling and orignal tiled floors. There is a large welly equipped bright dining kitchen . The lounge is cosy with a wood burning stove and comfy sofas .There is a flat screen TV ,English TV (accessed through the internet) and DVD player and patio doors leading to the garden. The garden has many plants and there is tiled patio with a mosaic dining table and chairs and sun chairs and a bbq. The bedrooms are tasefully decorated with shuttered windows and original tiled floors.The large master bedroom has beautiful Moroccan style four poster bed. I live here in Spain and love the area and the fact that it is still traditionally Spanish. What attracted us to this part of Spain was the amazing scenery and of course the tapas! The house is in really quiet street and so close to the shops and bars. The property was once a small fruit shop many years ago and is full of character and charm. The main reason why we bought this house was because we really loved the fact that it had a garden. Being able to wander into town and sit on the square in the sun in the afternoon for a few drinks and tapas. There are also many fiestas in the town were everyone dresses up and enjoys the festivities. Seperate feature glass brick shower, wc . Heaters in all rooms . Free parking on the street close to the house 30 m from the house (Previous client mentioned a parking fine in a review, the car was parked outside the town hall not parked near the house). Cosy lounge with beamed ceiling, two sofas and a wood burning stove. There is flat screen TV and DVD player and patio doors out to the garden. Well equipped large sunny dining kitchen with microwave,electric touch control hob, fan assisted oven, fridge freezer, washing machine. Dining table and four chairs. All English channels through firestick . The beautiful resort of the Sierra Nevada is one hour and fifteen minutes drive. Away from it all place - so brush up on your Spanish before you arrive, very little English spoken here. Gorge was beautiful, less impressed with the lake (but would be great in summer) and disappointed with Arab baths. 15 euros for a sauna basically, but a nice building. Lovely drive through mountains to surprisingly swish Malaga - well worth it. Torremolinos another 20 minutes further along - beautiful coast though town still a bit grim. In Alhama itself really liked El Tigre bar - not a word of English, but good tapas and food. Spanish tradition is big lunches and free tapas with each drink at night - variable quality at some on the main square. And it seems you won’t get any tapas with a coffee so encourages boozing. Louise very helpful and responds quickly to texts. Watch where you park - police are lightening fast to give you a parking ticket - 40 Euro’s! I found driving around Alhama a bit confusing at times - and very narrow lanes, but motorways north and south are excellent. gorge, and even hired bikes one day, and enjoyed the Turkish baths. The owner was lovely andhelpful. We would definitely recommend it to others. great house loved it .nice touch from louise with compliment extras in fridge. well appreciated .all you could want for self catering .great location .all in all a lovely stay .even though the weather changed so couldnt benefit from lovely outdoor space .thankyou for sharing you house . Very atmospheric, comfortable and roomy house in the Arab quarter of Alhama. Louise very generous in her communications and in the wine and food supplies left for us. A real retreat! Really pleased you enjoyed your stay and thank you for leaving the house so nice. Charming home in traditional Spanish Village. Louise left the fridge stocked to see us through the first day, which was really appreciated. The cottage is as described and did not disappoint. It is well located close to the town square, where their are restaurants and bars serving good food at reasonable prices. We loved the fact that there was a guitar available, which our daughter took advantage of. The outside area is very pleasant. The gorge is stunning, and the hot baths is an absolute must. Communication from Louise was excellent. We would definitely return. The countryside is truely stunning so perfect for birdwatching, walking and cycling . The waters of lake Bermajales are just 15mins drive with water sports and of course swimming. There are two outdoor swimming pools within the town and within walking distance and another with lovely gardens and a restaurant just outside the town.The beautiful Arabic baths of El Ventoro are also just outside the town and within walking distance.The Roman bathes and natural hot springs are a 5 min walk. The fantasic gorge is just 5 mins from the house ideal for a stroll and a picnic with amazing views. The nearest beach is at the resort of Torre Del Mar which is less than an hours drive.There are many beaches lovely along the coast. Granada airport is one hours drive and Malaga is an hour and an half . Directions will be given . A bus is available, or there are transfer companies. The town of Loja is 35mins drive. Granada is one hours drive. 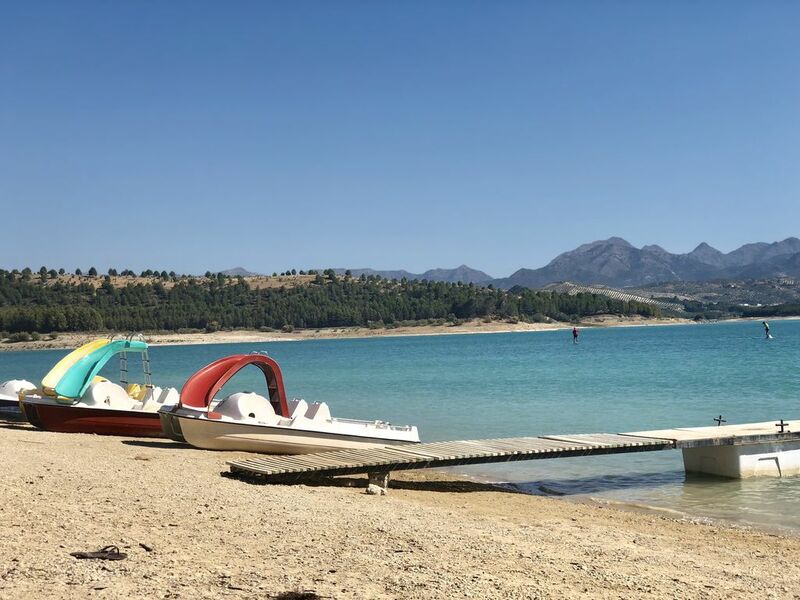 Lake Bermajales is 15 mins drive with swimming and water sports. There are many surrounding villages within 10-15 mins drive. The market is 2 mins walk and on every Friday with a big selction of fresh fruit and veg and loads of shoes !! There are many banks with cash machines, supermarkets and shops. In all there are over 30 bars in the town.